There is great power in words. You know this already. And there is great power in visual art, as well. When the two are in conversation with each other, something magical happens. The powers of each medium are revealed, and together each takes on additional depth and resonance. The term for writing that responds to visual art is ekphrasis. I first learned of the term when studying W. H. Auden’s famous poem “Musée des Beaux Arts,” which he wrote in response to the paintings of Pieter Bruegel the Elder. What I love about ekphrastic art is that it responds to the (ostensibly) unfiltered experience of visual art with the sense-making of the written word. We examine “Landscape with the Fall of Icarus” and take it in first as direct experience. Maybe we notice the plowman first, or the lovely boats, or the strange island fortress. And then we spot it: the pair of legs from Icarus as he falls into the sea. Or perhaps your experience of that painting is different from mine. After all, to describe art is to change it, comment upon it, or respond to it. Having experienced the painting, we can then turn to Auden to see what sense he made of it—and respond to him ourselves. Which brings me to Then Again: Vintage Photography Reimagined by One Artist and Thirty Writers. 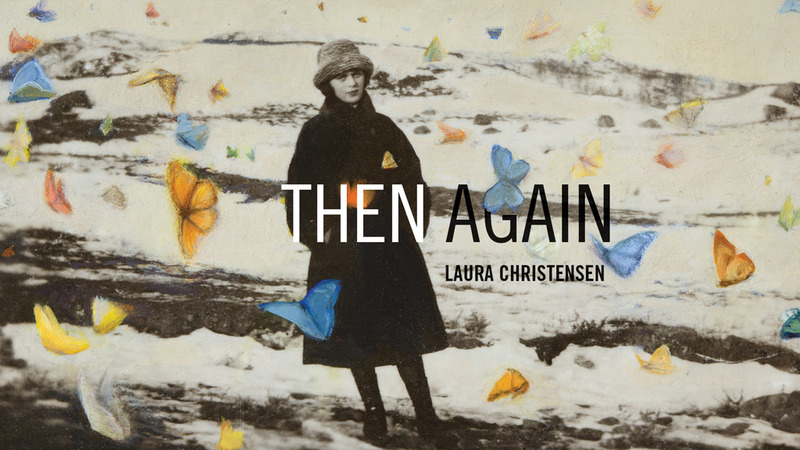 In this groundbreaking project, artist Laura Christensen paints on found vintage photographs to make stunning tableaus that exist on the edge of what is real or imagined. Where does the photograph of the girl with the ukulele end and the (presumably?) artificial tentacles that make up her lower appendages begin? The two girls holding the bunny seem real enough, but if so, what are we to make of the bleached-white bones behind them, the birds soaring overhead which almost seem to glow? When you see the lineup of writers Christensen is working with, I guarantee you will be excited. Included in the project are Safia Elhillo, Elizabeth Hand, Paul Park, Erin Roberts, Sofia Samatar, and many more. Christensen says about her art that “[she] relish[es] this practice of creating something in response to another existing thing. It shows how our experiences can affect what we do and what we create, which in turn may affect what someone else creates.” This chain of creation fascinates me. It has been said that art either comments on other art or on the world itself; Christensen and her collaborators are doing both, merging the real and the fantastic, weaving connections and possibilities, and reminding us all of the power of art to show us new worlds and to show our world anew. 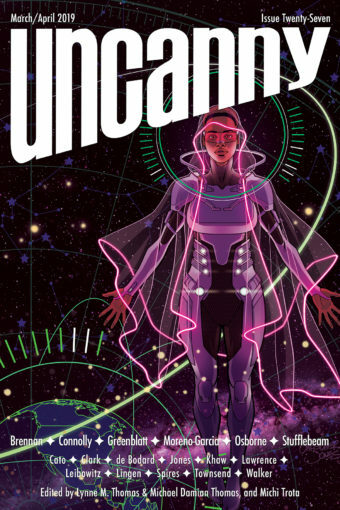 Uncanny readers, I know you care about art, about storytelling, and about the power of connections and communication. That’s why I’m hoping you’ll join in this chain of creation and help make this one-of-a-kind project a reality. The Kickstarter launches on April 2, and among its backer rewards is a special edition of Then Again. Please help us spread the word far and wide, and consider contributing if you’re in a position to do so. As you know, in these difficult times we desperately need art in our lives, and we particularly need art that helps us re-see what we think we know. While you’re at it, I encourage you to try some ekphrasis of your own. Go to a museum or write in response to your favorite movie. (I just might try this with Janelle Monae’s music videos.) Engage with art. Make your own. Join the conversation. Make magic. 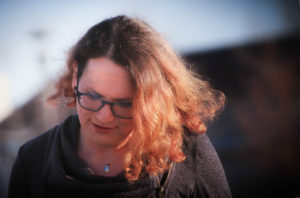 Izzy Wasserstein writes fiction and poetry, teaches writing and literature at a public university on the Great Plains, and shares a house with a variety of animal companions and the writer Nora E. Derrington. Her most recent poetry collection is When Creation Falls (Meadowlark Books, 2018), and her fiction has recently appeared or is forthcoming from Clarkesworld, Apex, Fireside Magazine, and elsewhere. She is a member of the 2017 class of Clarion West, and likes to run long distances slowly. Her website is www.izzywasserstein.com.